A handy combination cansiter for fuel and oil. 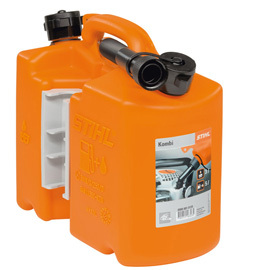 STIHL's orange combination canister holds 5 litres of fuel and 3 litres of chain oil together, as well as including two holders for storing tools and accommodating the filling system. Note: Tool and filling system not included.